OMEGA’S PX5500/PXM5500 transducer series provides high performance in demanding industrial and research applications where accuracy, reliability, and price are important. 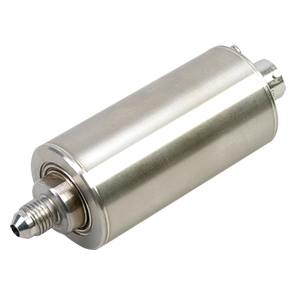 These transducers have a 10-year MTBF rate and are stable to 0.1% of FSO over an 18-month period. This translates into less downtime, fewer test reruns, more time between calibrations, and high confidence in your pressure data. When recalibration is impossible, relying on the high stability of the PX5500/ PXM5500 Series transducers may be the only cost-effective way to obtain pressure data over the long term. OMEGA’s thin-film technology makes this premium performance possible. The strain gages and associated parts are sputter-deposited directly onto the pressure sensing element, eliminating the need for adhesives. The resulting molecular bond between the sensing element and the strain gage ensures virtually no shifting, drifting, or “creep” in the performance of the transducer. The micro-geometry design of the PX5500/PXM5500 sensing element affords a very small, low-mass sensor that reduces effects of mechanical vibration and shock. The PX5500/PXM5500 gives you accuracy, reliability, and stability at competitive prices. The PXM5500 is also available in Standard configurations, with ranges from 0 to 15 psi to 0 to 10,000 psi and standard threads. Please see PX5500 for complete details, or contact our Pressure department for more information. Nota: Comes complete with 5-point NIST-traceable calibration. Visit us online for compatible meters.